This note is to invite you to a Tsawout Nation event (see attached poster) that will acknowledge those who took part in the Sept. 2 “Paddle for ȽEL,TOS,” and will also continue to raise funds for Tsawout’s legal efforts to reclaim James Island. W̱SÁNEĆ knowledge-holders will describe Tsawout’s historic and contemporary ownership of ȽEL,TOS, and will explore significant elements of Tsawout’s culture. An Indigenous vendors’ market will be set up (a great opportunity to get holiday shopping done, while supporting the local community), and video footage of the Sept 2 “Paddle for ȽEL,TOS” will be on display. If you have any questions, please do not hesitate to reach out to Sarah at sarah@rainwatch.ca or at 250-726-3794. Watch this video / photo compilation of highlights from the Paddle for ȽEL,TOS and the Salish Sea, on September 2, 2018! Thanks to Brian Rundell for putting the video together and shooting the footage. What a powerful and inspiring event in support of the call of the WSÁNEĆ People for the return of ȽEL,TOS (James Island) – with 280 Paddlers in 95 boats on the water (including eight big canoes and the barge with the Elders), and 400 people packed into the Tsawout Gym for the community meal and presentations. Thank you to everyone who participated and contributed toward the success of the event! Thanks to everyone who participated in the Paddle for ȽEL,TOS and the Salish Sea on September 2, 2018! What a powerful and inspiring event in support of the call of the WSÁNEĆ People for the return of ȽEL,TOS (James Island) – with 280 Paddlers in 95 boats on the water (including eight big canoes and the barge with the Elders), and 400 people packed into the Tsawout Gym for the community meal and presentations. We would like to supplement everyone’s inspiring memories of the day with an audiovisual archive, so please take a moment to upload any photos or videos to the ȽEL,TOS Paddle Photo Archive. You can create a new folder with your last name and then upload photos and videos there. Alternately, you can send photos and videos directly by email attachment to: turningthetide.ca@gmail.com. 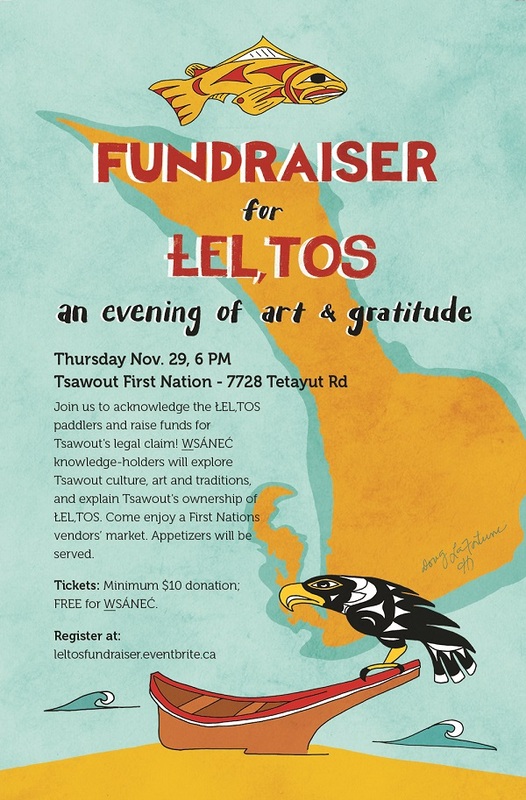 If you would like to provide additional support to the Tsawout First Nation to assist with research and legal work required for the ȽEL¸TOS claim, please mail a cheque made out to “Tsawout First Nation” (with the memo line “ȽEL¸TOS”) to Tsawout First Nation, 7728 Tetayut Road, Saanichton, BC V8M 2E4. Finally, we are beginning to turn our minds to a Paddle for the Salish Sea in 2019. Please let us know if you are interested in volunteering and getting involved, by emailing turningthetide.ca@gmail.com. HIS’KWE / Thank you again for your contribution to the ȽEL,TOS Paddle! A return to a rightful owner? That’s the issue at hand when it comes to an island off the coast of the Saanich Peninsula. Sunday, hundreds gathered in boats around ȽEL,TOS or James Island. All in support of the Tsawout First Nation’s claim to land that now belongs to an American Billionaire. Luisa Alvarez was there. ȽEL,TOS or more commonly known as James Island is privately owned and has been for 150 years. But before that, the Island belonged to the Tsawout people and they want it returned. “The island has been a part of our traditional territory right from the beginning of our creation so we have made an assertion to claim it back,” said elected Tsawout councillor Mavis Underwood. Over 200 people attended the demonstration to support the claim that is now before the courts, including federal green party leader Elizabeth May. “It’s a triumph that indigenous peoples in Canada have held onto their culture their language their traditions and even fragments of land being restored is an important step forward,” said May. Many who attended took to the water at Cordova spit in canoes, kayaks, and boats for the four-hour journey around the island in solidarity with the people of Tsawout First Nation. 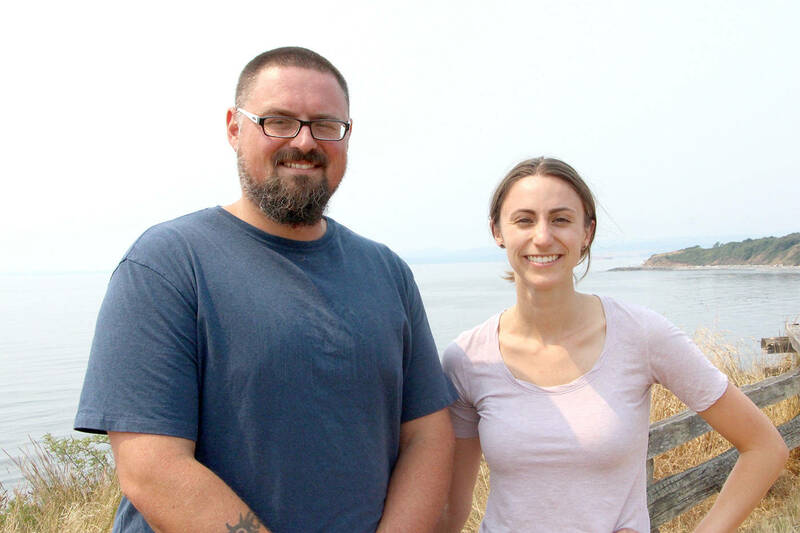 “It shows that settler people like me are allies with indigenous people and that our communities coming together in solidarity to repair past wrongs and build respectful relations moving forward,” said volunteer and Victoria City Councillor Ben Isitt. Not only does the Island have archaeological significance to the Tsawout people it was traditionally used for fishing hunting and gathering because it’s rich in plant-life and seafood. Although the Island has had significant ecological impacts due to past industry. “Right now there are golf courses, there’s resorts… [on the Island] they made one-tenth of the TNT that was exploded on the western front by the British empire and then they made paint for half a century,” said Isitt. Underwood says if returned restoration and decontamination would be a priority. “We want to see people really proud of what’s provided in the water it’s all very important for us to be able to educate the young people to inspire them and have our way of life continue,” said Underwood. Sign up today for the Sept. 2 Paddle for ȽEL,TOS and the Salish Sea! And please help spread the word by sharing the video and encouraging other people to join the paddle and the events on shore. All welcome! Tsawout Chief and Council invite all relations in WSÁNEĆ and neighbouring communities to participate in the PADDLE FOR ȽEL¸TOS and the Salish Sea, in support of Tsawout’s claim to the island, also known as James Island. The event is taking place on Sunday, September 2, 2018, beginning at 9:00 am at ȾIX̱EṈ (Cordova Spit) with a community breakfast, followed by a paddle around ȽEL¸TOS (James Island) and then a feast in the Tsawout Gymnasium. The history of use and occupation is significant combined with significant archaeological history. The island was part of the homelands and provided a rich, productive way of life as it was well supplied with plantlife and surrounded by a rich variety of saltwater food supply (fish/shellfish). When it was taken over as part the war efforts it was still occupied and people felt that the island would be fully returned once it was no longer required. However the history shows that the Tsawout/WSÁNEĆ People were forced off the island and it then became privatized and was eventually sold. In the past Tsawout has made overtures to have the island rightfully returned and it is hoped that this time justice will prevail and the island will be restored as part of the homelands. The Paddle for ȽEL¸TOS will be hosted by Tsawout, facilitated by a number of neighbours/supporters/advocates on September 2. The event will kick off with a light 9:00 am breakfast on September 2. It is estimated that the paddle depending on currents/traffic should take about three hours. There may be some information booths on the beach but there will also be a Vendors Market at Tsawout Gymnasium with an Indigenous Tea Room in the Multipurpose Room opening at 10:00 am. At 2:00 pm there will also be a Celebratory Meal with invited speakers to speak on the significance of the island to Tsawout. People are invited to participate in canoes, kayaks and other human-powered water craft. Space for youth, elders and others is available in support vessels and large canoes. People are also invited to join the events on shore. “We invite all relations to join us in advancing our Treaty rights to ȽEL¸TOS,” says Chief Harvey Underwood. “We welcome community members and allies in WSÁNEĆ territory and neighbouring communities to join us for the paddle and events on shore.” Tsawout has asserted ownership of ȽEL¸TOS, which despite never being surrendered fell into private hands contrary to the Treaty and Crown policy. Tsawout would like the Paddle event to be a fundraiser to assist with the research and legal work required for the claim and will be accepting donations prior to the event and at the event made out to TSAWOUT FIRST NATION with notation for “ȽEL¸TOS” (which can be mailed to Tsawout First Nation, 7728 Tetayut Road, Saanichton, BC V8M 2E4). 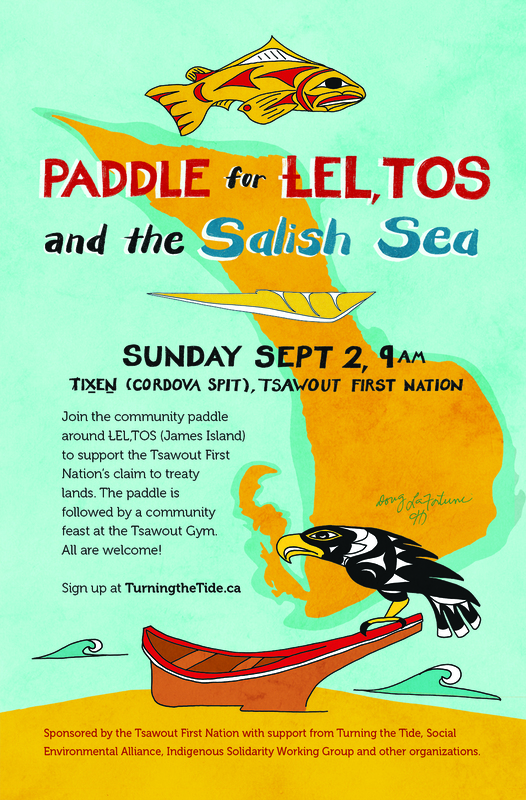 To join the Paddle for ȽEL¸TOS and the Salish Sea, sign up today at: http://www.TurningtheTide.ca/leltos. 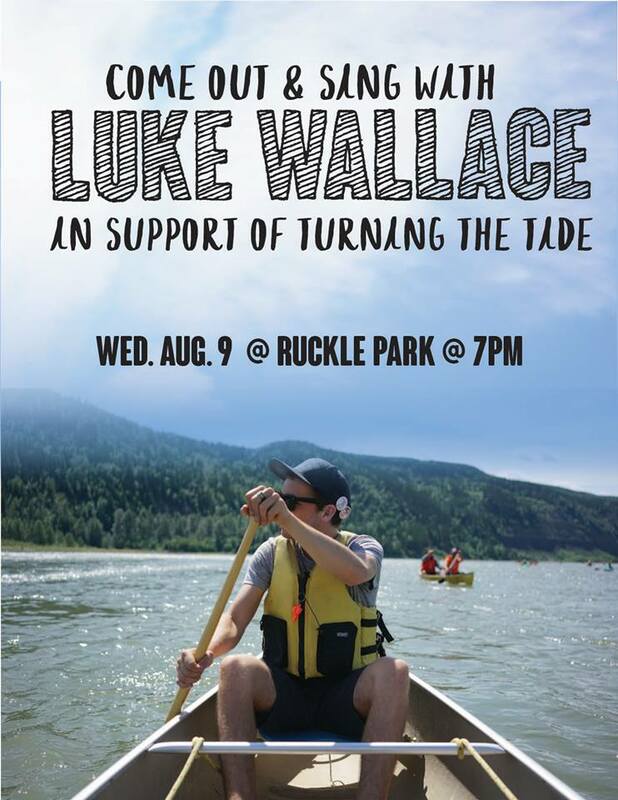 Congratulations to Luke Wallace and our inter-islands community on the release of “Turning the Tide,” recorded live on Salt Spring on Turning the Tide 2017! Recording Turning the Tide on Salt Spring island was a truly memorable night. The turnout was amazing and the energy in our wide circle reflected the shared love that we all have for the Salish Sea. This recording was in celebration of an initiative, also called Turning the Tide, where folks use human powered vessels to travel the Salish Sea, share rich ecological experiences and gain some inspiration to take with them. The people involved in this paddle-focused trip continue to show a deep commitment to the protection of people, communities and the ocean both during TTT and throughout the rest of their lives. For many, this is a chance to reconnect with the planet they are fighting so hard to protect and to remind themselves of the interconnectedness of all life. One of the important issues that the folks from Turning the Tide seek to address is the ongoing threat of an oil spill in the Salish Sea. The Kinder Morgan pipeline, terminal and associated tanker transport pose a massive and unacceptable risk to all the people and species that rely daily upon a healthy ocean for their survival. Moreover, the federal government of Canada has approved a massive expansion of the pipeline which will result in a 7-fold increase in tankers carrying tar-sands oil/bitumen through the Salish Sea. The response by the public has been nothing short of inspiring. First Nations all over ‘BC’ are rising up, asserting their rights and demanding that the expansion not only be canceled but that all oil transport be ban in the Salish Sea. The City of Vancouver and Burnaby have come out in full opposition to the expansion and the new provincial government has also taken steps to block the pipeline. Organizer Sasha Kvakic discusses the 4th annual Turning the Tide: Peoples’ Paddle for the Salish Sea, travelling through the Southern Gulf Islands, WSANEC/Hul’q’umi’num territory, from August 9-13, 2017. Learn more at: www.turningthetide.ca. After five days paddling the Salish Sea and breathing the ocean air, Emily Rogers is resolved to fight for what she loves. In the early morning of Wednesday, Aug. 9, more than 80 people young and old will depart from Dolphin Dock in Swartz Bay on a five-day paddle across the Salish Sea in protest of increased tanker traffic, advocating for greater environmental protection of the waters and the wildlife it sustains. Rogers is one of the event coordinators for the event called Turning the Tide now in its fourth year. She says paddling the ocean built a bond stronger than any connection she’s experienced in her life. She hopes the experience of being on the water inspires other participants to advocate for protecting the ocean as well. The journey takes paddlers in their kayaks and canoes from Swartz Bay to Portland Island, Salt Spring Island, North Pender Island, Prevost Island and Moresby Island, for about 29 nautical miles (54 kilometres) in total. Participants stop at each to rest and participate in workshops such as ocean navigation and reading tides. Jeremy Loveday, a Victoria city councillor and event organizer, sees the event as a way to connect with the community. “The theme this year is building solidarity across the Salish Sea, so it’s to bring people together, to get that experience of being on the water, to break bread, make those connections and to leave with a stronger network of solidarity across the islands of people who are willing to stand up and fight to protect our coastline,” he said. Loveday says the trip has been one of the most memorable experiences of his past three summers. For more information, visit turningthetide.ca.